Over the last century, the conventional allopathic medical model has come up with an ever-increasing list of hundreds of diseases and thousands of medicines for treating these diseases and/or their symptoms. 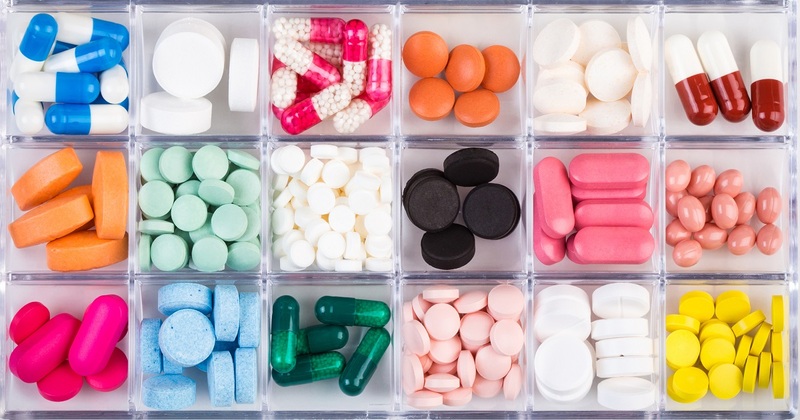 More than 50 percent of Americans take at least one prescription drug and one-in-six takes at least three. There are currently over 1000 approved cancer drugs. This palliative approach in no time has you taking a pill for cholesterol, a beta blocker for the heart, calcium for your bones, and so forth. In 100% of cases these pills will not cure the disease or address the root cause – instead, they are prescribed for alleviating or controlling the symptom(s) as in the case of blood pressure medication, or insulin for diabetes. Unfortunately, a great majority of practitioners of alternative medicine will do the same; they will suggest enzymes for poor digestion, vitamin X or Y for deficiency X or Y, antioxidants for low immunity, etc.Sadly, with this approach, the initial cause(s) of the disease are rarely addressed, and the disease often progress along with related side effects from the medication that require additional medication to be added to your regimen. I call this approach of addressing the symptom(s), and not the cause(s) – Fighting the battles, losing the war. Yes, with a pill, one may pacify a symptom – win a battle until the next crisis or flare up. But this patching approach will not win this war between health and degenerative disease that has been progressing for decades. By now other areas of the body are silently affected, while not yet diagnosed. We demystify diseases when we agree that diseases and their symptoms first begin with the cellular level and eventually impact the organ (liver, pancreas, etc. ), and metabolic (blood sugar, thyroid hormone, etc.) level. I assume that you do know that ALL our organs, glands, skin, bones, tissues, brain, and even blood are composed of trillions of tiny living cells. Keeping this in mind, it is logical to say that the unhealthy cells of an organ will eventually cause that organ or/and its function(s) to be unhealthy, as with diabetes, when pancreatic cells responsible for insulin become malfunctional. With degenerative diseases, once symptom(s) appear in one organ, the cause(s) leading to those symptoms have surely been impacting cells of other organs in your body, and that most likely for quite for some time, even decades. We don’t catch diseases, we make them. Though there are exceptions and inexplicable causes to certain diseases, it remains that most diseases and their symptoms are self-made over years or decades of neglect and/or deficiencies, and/or toxicity due to poor diet, too much food, junk foods, stress, weight, obesity, lack of rest, lack of exercise, etc. During those years, even with these abuses, the cells in your body are holding on, keeping your organs and glands as healthy as possible like good soldiers working together to win the daily battles, when recovering from too much food, sugar, and salt overload, etc. In time due to these deficiencies and toxicity, battles are lost, recovery is not total, you are aging, fatigue sets in, imbalances creep in, and symptoms manifest. Once symptom(s) manifest, it is often systemic, and a great many cells, not just those from the symptomatic organ(s) or condition(s) may be fatigued, toxic and deficient in nutrients and energy. These cells are likely already less efficient in conducting their myriad of metabolic activities: repair, detoxifying, growth and re-generation. At the next level, the organs, due to cellular inefficiencies in their cells are now less efficient in their own metabolic function(s). For example, with diabetes, the pancreas is sluggish in regulating the blood sugar with insulin, or the skin and the kidneys in the process of synthesizing vitamin D.
At this point, the organs of the brain – the hypothalamus, pituitary (master), and pineal glands, known as the governing level responsible for overseeing all metabolisms are also affected by this cellular disease and rendered less efficient in controlling critically important metabolisms like that of blood sugar, pH (acidity/alkalinity), and even each beat of the heart. Aggravating the problem, after years and often decades of metabolic inefficiencies (improper pH, blood sugar, temperature, fats, etc. ), the cells, the organs, and the endocrine glands have become miss programmed into tolerating these negative behaviors. The body now thinks it is in a “healthy” state of existence. For example, when the hypothalamus has become lazy (called a negative feedback) in regulating the misbehaving pancreas, we have a chronic condition often called diabetes. At this stage various metabolic activities are imbalanced or dysfunctional and operate poorly; starting at the mitochondria (Krebs cycle) with less efficient ATP (energy) fabrication, which leads to poor assimilation, absorption and elimination, poor hormone, enzyme and protein synthesis, improper osmosis of oxygen and water (hypoxia and dehydration). There is chronic acidity and resulting acidosis; not only do you have incorrect pH levels, but because of inefficient flushing of cellular debris, you have accumulated acid ashes inside and between the cells. These conditions have lead to infestations of bacteria and parasites (fungus, yeast and Candida), to “bad” fats (high cholesterol) and lack of viscosity, to crystallization of fats and other unassimilated debris into plaque and arthritis. Your food / nutrients digestion and elimination have become deficient; you have lost your “vibrant” healing energy and it’s now a vicious cycle. How do you restore cellular health? The wholistic approach to cellular health is to first realize that the doctor is the body itself. Each cell is geared to self-heal. The doctor is within, not without. After all, this body built itself from two tiny cells and managed quite well without an “external doctor” usually for decades, defending itself from millions of viral attacks, free radical damage and constant pollution from foods and air. 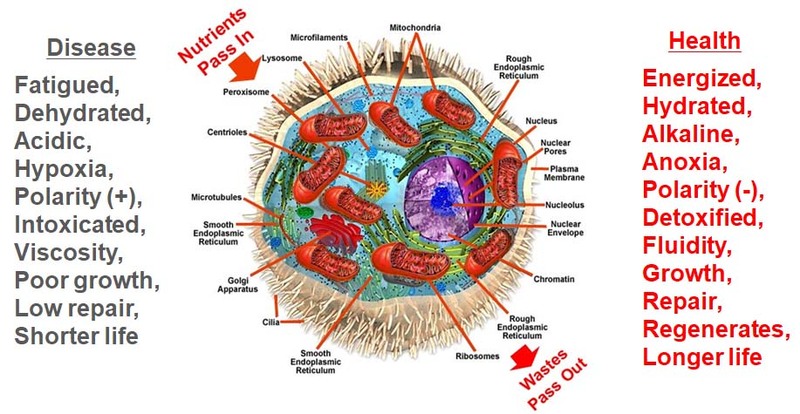 Wholistic health is gained at the cellular level. This view is supportive of “the doctor within” rather then interventionist. I call this approach “winning the war, not just the battle”. One – Do no harm: Begin by limiting the causes of cellular toxicity and burden: Abuse of foods, proteins and sugars, dead, toxic and depleted foods and beverages, pollutants and toxins of all kinds including mental and emotional negativity. All substances like food, light and even people carry energies that will either raise or lower yours. Two – Nourish your cells: Eat a high energy diet of fresh organic colorful fruits and vegetables with little meat and fish. Look for the “energy” in foods which we derive from natural minerals, trace elements, carbohydrates and chlorophyll contained in fresh and organic fruits and vegetables. Fasting is as important as eating. I call it “getting out of the way”. Fasting has been used as an element of health since the beginning of time. When a cat is sick, it stops eating until it gets better. During the fasting phase of the night, our liver is given a chance and performs a myriad of biochemical processes. Give yourself a chance. Introduce safe and short fasts in your life daily, weekly, monthly and annually. We humans must exercise in order for our cells to not rust. The value of exercising is proven, enough has been said; just do it. Move your body, your lymphatic systems, increase your pulse and your temperature moderately; this will kill viruses, remove toxins and balance fats in each cell of your body. Shake each cell in your body with daily exercises like walking, running, yoga, etc. In natural medicine, we say that 50% of toxicity is caused by our emotions, our state of mind. Maintain your spiritual and emotional balance with exercises, yoga, qigong, tai chi, meditation, prayer, etc. Four – Its possible to reprogram (restore the positive feedback) the governing organs: With degenerative and chronic conditions, the dietary and lifestyle changes recommended above may not be sufficient to reprogram the miss programmed governing organs of the brain. To regain health of your brain organs, you must do more; I propose a diet rich in plant based wholefoods rich in those nutrients that are known deficient in the brain; foods that are rich in minerals and trace elements, rich in green, blue and red pigments and carotenoids, in chlorophylls, in fatty acids omega 3, 6, 9, gamma and alpha lipoid acids – “the good fats that heal.” And you must rest the body and sleep more, plus do more to enhance your fitness with exercises and activities. Remember the Road back up to Vibrant, Buoyant Health is also Not a Straight Line! B) Line representing state of poor health with its many symptoms, aches, toxic poisons, etc. C) The point at which one decides to do something about it and decides to rebuild using Nature’s way. D) Point of reaction – some glands have recuperated, others lag. You feel OK, you are too active with your new vigor and suffer a relapse or reaction. E) You start to lose Faith in Nature’s way! F) E to F – Stabilization period where lagging units catch up. This is a danger point. Can you do it Nature’s way. G) Again, advance units go too far ahead of more devitalized glands, organs, muscles. Over-exuberance causes strain – hence a setback. NOW IS TIME to STICK TO IT! H) H to I – Another stabilization of ground gained. I) I to J – Start of another spurt toward health, etc., etc. J) Reaching a nice level of wellness – don’t sit on your laurels! K) K to L – Another stabilization of ground gained. L) Start of another spurt toward health, etc. Bonus – As soon as you decide to embark on your journey back to greater health, I suggest that you immediately introduce Bio-Algae Concentrates (BAC) in your daily regimen. 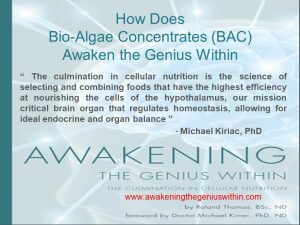 BAC is likely the most efficient food complement on earth, a blend of microalgae with extraordinary nutritional values, an extraordinary shortcut to brain health, an additional ally in restoring cellular, organ and metabolic health. Please refer to a set of charts that I have created to illustrate the mechanism of action and biochemical rationale to shed light on why BAC can be your greatest ally in your quest for wellness. 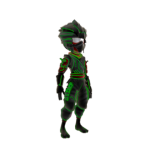 Click on the title image to view the charts.